"What if you had the chance to live your life again and again, until you finally got it right?" 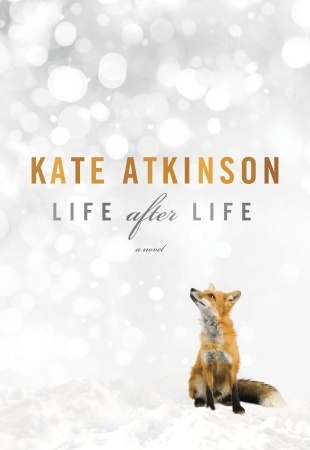 Life After Life combines the notion of eternal recurrence (and Nietzsche's amor fati) with the well-known thought experiment: if you could go back in time and kill Hitler, would you do it? Ursula Todd, born just before World War I, lives the same life over and over again, making small changes each time that have big consequences. In one of these iterations, she kills Hilter. In the others, she saves herself and other people. We witness the many variations of her death, which are almost always horrific and tragic. This book was difficult to read for two reasons, the first being the above-mentioned deaths. But that's also what's really great about it. As we read, we know she's going to die again, but not how or when, and that creates a lot of suspense. Watching her deaths also creates a lot of compassion for the character. The title may be Life After Life, but what really stood out for me were the deaths. Maybe that's just my morbidness showing. The other difficulty was the confusion created by the narrative. We are necessarily taken back to the past with each new beginning, but that's not the problem. Even within each life, the story is told out of sequence, with Ursula being one place and flashing back in her memory to previous experiences. There were also a lot of characters and places and details to keep track of, some of which are mentioned once in an early life and only referenced again much later. I have a terrible memory, though, so this may not be a problem for most readers. There was a lot of untranslated German language, which I found frustrating. There was some French, too, but I was able to use the remnants of my 6 years of school French to figure it out. I'm completely lost when it comes to German. In the climactic scene, I had to stop and Google the phrase "Wacht auf, es nahet gen dem Tag," (Awake, the dawn of day draws near), which ruined the flow. There were a ton of other casual references to things I'd never heard of as well. Those parts were an alienating reading experience. Don't get me wrong, I don't expect everything I read to be familiar to me, but I do expect some context, some translation. Instead they were dropped into the narrative as though Atkinson expected them to be common knowledge to her reader. Not everyone is a history buff, but historical fiction should be accessible to everyone. Mind you, as frustrating as this feature is, it's not an insurmountable obstacle to reading this book. Ursula's many lives are an emotional roller-coaster. Her family is extremely well-written, each character delineated and individual without seeming like one-trait caricatures. Atkinson does a pretty good job with the minor characters as well, making them seem like real people despite their short amount of "screen time". There were so many of them, though, it was hard to keep track. At the end of this book, I found myself feeling a sense of profound horror. Because after Ursula manages to put herself in a place to kill Hitler, and does it, she's born yet again. It's one thing to contemplate eternal recurrence, quite another to realize that, in the end, there is no end. Did she really accomplish her goal if she's born yet again, forever? Does she have to kill Hitler forever? By the dozenth or so life, her sense of deja vu was making her crazy. And it all seems so pointless, because when she resets, everything she did is erased. Even when she arguably lived the best possible life, she has to do it again. It may start out seeming like an opportunity, but eventually seems like the most hellish kind of trap. Anyway, this book will make you think, if you choose to. Or you can just ignore the implications and focus on Ursula's variations, almost all of which are interesting but tragic and heart-breaking.